Fronts – The 4200 Series shock is a large body mono-tube (gas) shock with a hard black anodized aluminum body. This shock uses CNC machined aluminum internal parts designed for racing with no aftermarket parts. 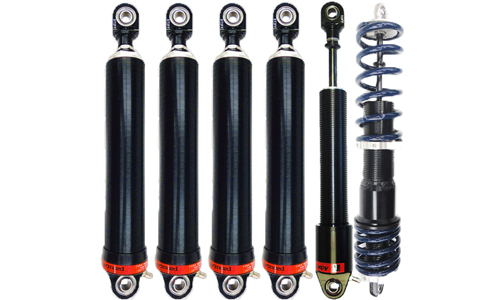 These shocks contain the latest T/C valving with a large diameter flat line piston for maximum front grip. They are E-Model Eye (Rebound) Adjustable that include the new style adjusting wheels that allow the eyes to be removed easily to change bump stops. This shock utilizes a base valve that is installed between the floating piston and the valving piston to isolate the pressure, allowing for substantial reduction in rod pressure. These rebound adjustable shocks contain check valves to ensure no bleed-over when adjusting the rebound dampening. This shock has a Schrader valve that provides for fine tuning the gas pressure. This shock accepts 2 ½” I.D. or 5” O.D. Springs and is available in 5”, 6”, 7”, 8” & 9” shaft lengths. Left Rear Front – The 4200 Series shock is a large body mono-tube (gas) shock with a hard black anodized aluminum body. This shock uses CNC machined aluminum internal parts designed for racing with no aftermarket parts. This shock contains the latest T/C valving with a large diameter flat line piston for maximum front grip. This shock is E-Model Eye (Compression) Adjustable that includes the new style adjusting wheels that allow the eyes to be removed easily to change bump stops. This shock utilizes a base valve that is installed between the floating piston and the valving piston to isolate the pressure, allowing for substantial reduction in rod pressure. This compression adjustable shock contains a check valve to ensure no bleed-over when adjusting the compression dampening. This shock has a Schrader valve that provides for fine tuning the gas pressure. This shock accepts 2 ½” I.D. or 5” O.D. Springs and is available in 5”, 6”, 7”, 8” & 9” shaft lengths. Left Rear Back – The 4200 Series shock is a large body mono-tube (gas) shock with a hard black anodized aluminum body. This shock uses CNC machined aluminum internal parts designed for racing with no aftermarket parts. This shock contains the latest T/C valving with a large diameter flat line piston for maximum front grip. This shock is E-Model Eye (Rebound) Adjustable that includes the new style adjusting wheels that allow the eyes to be removed easily to change bump stops. This shock utilizes a base valve that is installed between the floating piston and the valving piston to isolate the pressure, allowing for substantial reduction in rod pressure. This rebound adjustable shock contains a check valve to ensure no bleed-over when adjusting the rebound dampening. This shock has a Schrader valve that provides for fine tuning the gas pressure. This shock accepts 2 ½” I.D. or 5” O.D. Springs and is available in 5”, 6”, 7”, 8” & 9” shaft lengths. Right Rear – The 3200 Series shock is a small body mono-tube (gas) shock with a hard black anodized aluminum body. This shock uses CNC machined aluminum internal parts designed for racing with no aftermarket parts. This shock is rebound adjustable valved for maximum traction with the latest T/C valving. This shock is E-Model Eye Adjustable. The base valve design in this shock allows for very low gas pressure to be used and still function properly. This shock gives the driver more feel and allows the car to grip the track more. This shock has a Schrader valve that will accept 10-50lbs. gas pressure which provides for fine tuning the chassis balance. The small body shock accepts 1 7/8”, 2 ¼” & 2 ½” I.D. Spring & is available in 5”, 6”, 7”, 8” & 9” shaft lengths.